The potential home of a future eBART station in Brentwood won the unanimous endorsement of the BART Board of Directors Thursday. The board passed a resolution of support for the proposed Brentwood Transit Center and Mokelumne Trail Bridge, which could someday become part of the transit agency's eBART system. "The resolution from the BART Board is an important step in showing the strong regional support for building the Brentwood Transit Center," BART Director Joel Keller said in a written statement. The transit center plan calls for what at first will essentially be a bus hub that would connect passengers from eastern Contra Costa County to the planned eBART station in Antioch near Hillcrest Avenue. "The transit center would remove approximately 1,000 cars from Highway 4 for more than four miles past the Antioch eBART station by providing parking for customers taking Tri Delta Transit to BART," Keller said. If eBART is ever extended to Brentwood, the station would most likely be built at the same location. In March, the Brentwood City Council voted unanimously to explore building a transit center near the intersection of the Mokelumne Multi-use Trail and State Highway 4, which is between Lone Tree Way and Sand Creek Road. No money has been allocated for the project, other than $550,000 in Measure J funds for a Mokelumne trail bridge over Highway 4. The bridge project, however, is estimated to cost roughly $8 million. 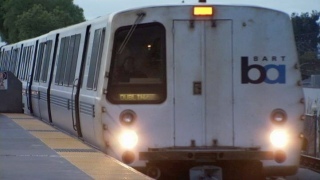 The eBART system is currently under construction and will connect the Pittsburg/Bay Point BART station to a Pittsburg Center station and an Antioch station when it opens in May 2018.
eBART is a light-rail system that will operate with independently propelled diesel trains.